Major changes have occurred in West Colfax, beginning with the opening of three W, West Corridor line (as shown both individually below and in context with bicycle connections to Auraria, Lodo and downtown) and the subsequent redevelopment of the 19 acre St. Anthony’s site as Sloans Denver as a LEED Gold Neighborhood. At WCBID, we are working hard to ensure that changes will benefit both new and longer-term residents, expand neighborhood-serving businesses, and maintain income diversity in the neighborhood. The BID was formed in late 2006 as an outgrowth of the West Colfax planning process in order to implement the goals of the West Colfax Plan. Among the first priorities of the BID was to promote the adoption of Main Street Zoning along West Colfax, which was formally adopted in April, 2007. 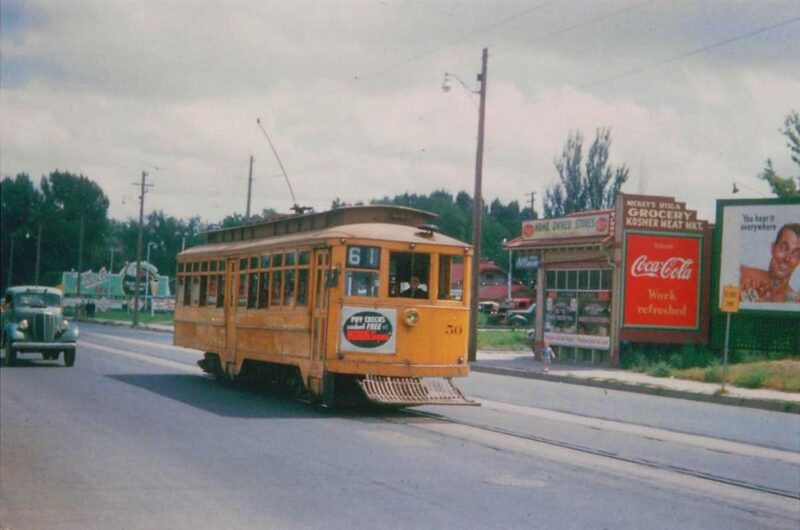 West Colfax was originally connected to central Denver by streetcar–the viaduct came later in the early 1900’s. That is how people traveled to Elitches on Sloans Lake, for example. The new light rail re-establishes this important connection and the ease of commuting from West Colfax. The image below was taken in 1949 in front of 4500 W Colfax.